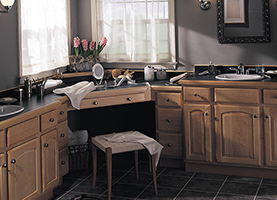 At NU Kitchens & Floors Inc, we offer state-of-the-art bathroom design and installation solutions. 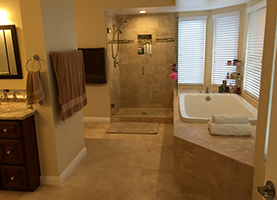 Our shower remodeling solutions at NU Kitchens & Floors Inc will complement any existing décor. Home renovation projects can be stressful and anxiety-ridden, especially when you are investing in a kitchen or bathroom upgrade. Not only do you have to consider the feasibility of the project you want to take on, you also have to stay within your budgetary means; but not to worry. You do not have to carry all the heft alone. For the best home additions and renovation services in Orange County, CA, look no further than our team at NU Kitchens & Floors Inc.
At NU Kitchens & Floors Inc, we are committed to providing innovative home renovation designs and solutions for all of our customers. From the design stage up until completion, our talented renovation specialists will work with you to create a blueprint that truly aligns with your unique style preferences and needs. We are passionate about creating a result that meets and exceeds your expectations. There are various contractors out there specializing in a specific kind of project. However, we at NU Kitchens & Floors Inc provide a number of services that are always tailored to accommodate the goals of any customer. Our trademark in the home renovation industry is providing homeowners with quality customer service and workmanship. When you call on us at NU Kitchens & Floors Inc, you can have the peace of mind knowing that you are in good hands at each step of the way. We are abreast in all city permits and regulations, and our service is always delivered with expediency and diligence—and we do so within your budget. We at NU Kitchens & Floors Inc are proud to offer second-to-none home renovation solutions at unbeatable prices. Learn more about our home remodeling services today.